There are far better alternatives to each of these moves. So why are you still doing them? I couldn't believe what I was seeing across the gym floor. I grabbed my iPhone, set it to video, and without calling attention to myself, recorded the culprit in action. I swiftly texted the evidentiary footage to another editor for confirmation. The crime that was committed? No, it wasn't another clown using bad form in the gym, but rather an individual performing a movement that's simply ill-advised. Rarely do we venture into the realm of admonishing "Do Not Do This Move." That's because we agree that just about every exercise in the gym has some benefit. Sure, lots of folks don't know how to do many of them correctly—deadlifts, bent-over rows, squats, and lateral raises come to mind—which then makes a perfectly good movement dangerous. But poor form aside, we call out these five exercises in particular, which range from dangerous even if you do them right, to, "Uh, buddy, there's a better way to do that." So what should you take off your exercise list? Here's our top five. 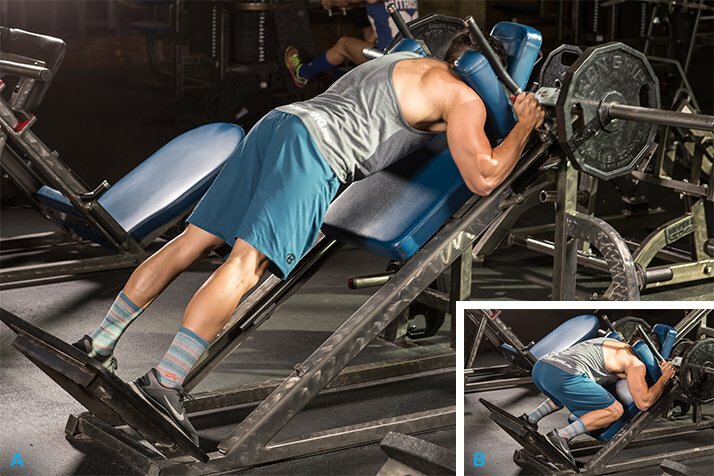 Instead of setting your body against the back support of the hack squat, you reverse your body position and face the unit, giving you an all-new machine move with which to work your glutes, quads, and hams. Where to start? For one, there's nowhere to place your neck so that it isn't jammed into a poorly aligned position. During training, you always want to keep your neck in a neutral position facing forward and in line with your body—not up, down, to the extreme left or right. But the machine was designed to support your head when your body is facing outward, so now you're forced to accept a highly compromised cervical spine position. And many of us can use fairly heavy weights when training legs. Heavy loads with poor spinal alignment is a dangerous combination. While this may be a machine movement, you lose body support when facing inward (though there's some at the shoulders). Unless you know how to do this movement correctly, you can easily bend at the knees or hips a little too much, not sink your hips back far enough, and/or round your back. It's conceivable you could herniate a disc at both the lumbar and cervical regions with one movement! Finally, getting a stable foot position can be tricky. The foot sled was designed for the other way around, so it's too far behind your body to be useful. You may be tempted to use the machine's supports to plant your feet, but they weren't designed for that. Not only are the angles in your ankles wrong—meaning your feet are bent awkwardly—but most are metallic surfaces, causing your feet to slide as you push off. If you want your body supported, machine squats and hack squats are your two best places to start. Even the lying squat machine allows you to keep your spine in a safe position. This is a lateral-raise movement for middle delts, a single-joint movement. An EZ-bar is substituted for a dumbbell. We've seen this done a few times at various gyms recently. The only possible explanation we can think of is the desire to achieve some sort of muscle-confusion training stimulus. The only thing confusing us is why you're using an EZ-bar. The EZ-bar is much harder to control in your hand, which means your grip will get a great workout, and you'll get better overall stabilizer activity trying to balance the motion. But that comes at a cost—it always does. You'll have to use a lighter weight than you would using a dumbbell, meaning less activation on the middle delts. If that's an acceptable trade-off for you, then go right ahead. But we're left to ask: What was so wrong with using a dumbbell? Lateral raises with dumbbells or a cable. 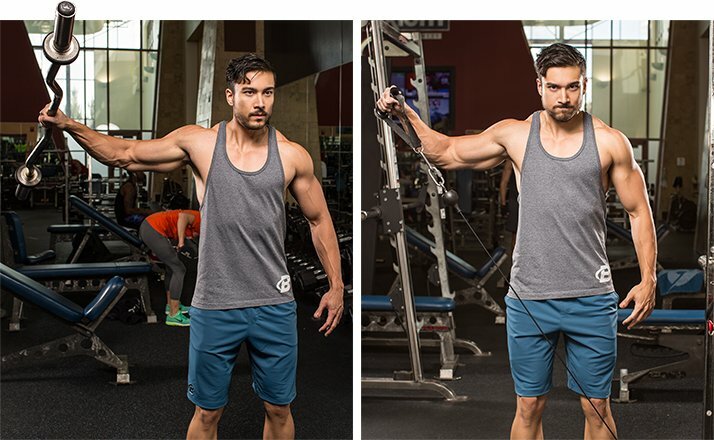 Grasp an EZ-bar with just one hand, centered in the middle of the bar, and do a standing single-arm curl. If you can do two of these simultaneously, you should've been a baton twirler! Muscle confusion is taken to whole new levels when EZ-bar moves are done with just one arm. But it's harder to balance the weight as you curl, so your forearms get a better workout than your biceps. And if you try to supinate on this movement—well, good luck with that. Use two hands with bars; stick with dumbbells for single-joint moves. 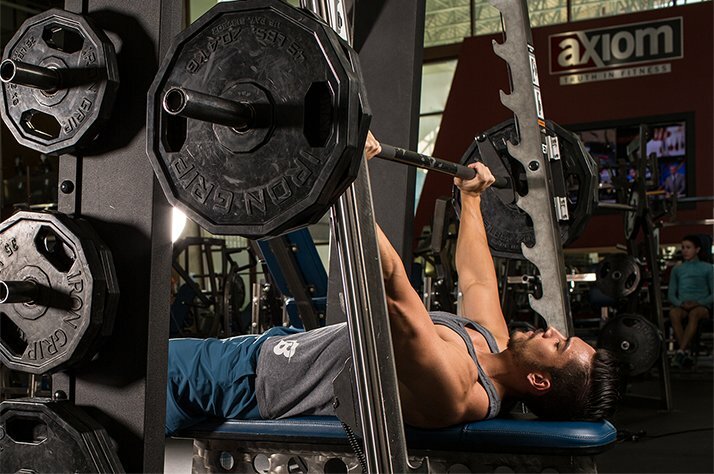 Set up a flat bench in the middle of the Smith machine, slide onto the bench and under the bar, and go. Remember those puzzles in Highlights magazine you did at the dentist's office as a kid, where you tried to determine what was wrong with the picture? That's kind of what's going on here. And it all has to do with whether the Smith machine uses a straight up-and-down plane of movement or is slightly angled. If it's angled, every exercise you do on the Smith machine bears scrutiny. 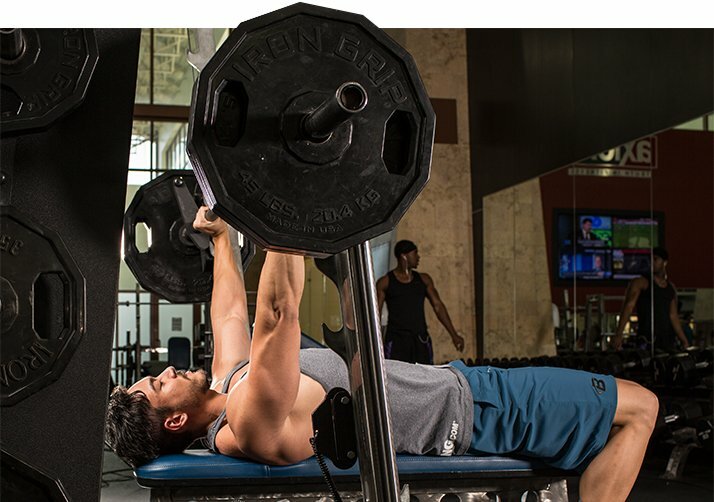 When you're doing bench presses at a barbell station, the natural path of the bar goes from a point on your lower chest to arms directly up in the air. Viewed from the side, the bar is traveling in an arc. You can simulate that same arc if your head is inside the angled Smith machine as the bar travels up and back over your face. It's not always easy to say "always face in or out" when doing Smith-machine exercises on an angled machine; it depends on the natural arc of the free-weight movement. For example, with behind-neck barbell presses, the bar travels from behind your head to directly overhead; whereas with front overhead presses, it naturally travels in the opposite direction. So on an angled Smith machine, you'd want to be facing in different directions on your bench, depending on which version of the overhead press you're doing. Consider the natural path of the bar, and when using an angled Smith machine, select the direction to face that most closely mimics the natural motion of the bar. With bench presses, your head should be inside the unit, but the direction your body faces isn't always the same. You use accessories to place your body in an unstable position, such as by doing squats on a wobble board or dumbbell bench presses on an inflatable exercise ball. If your goal is to build strength or muscle, lose these gimmicks. You have to sacrifice so much in terms of weight that you'll never be handle anywhere near your maximal loads. Go ahead: Try a dumbbell bench press on a flat bench with your 8RM and the same movement with the same weight on an exercise ball. Not everyone trains for just size and strength, though. In fact, athletes often find themselves in an unstable environment on the field or court. For them, training on unstable surfaces could theoretically complement traditional strength-training methods. If you're training for maximal size or strength, stick with basic movements with your feet on the ground or body supported so that you can go heavy. We recommend that a bodybuilder or strength athlete ditch unstable training altogether. Any benefits that might result aren't worth the decrease in the load you'll be able to handle.